We love Fluval and their products, and we especially love being able to share their information with you! 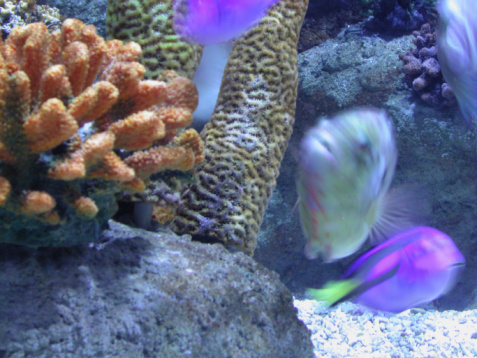 Check out these great tips for decorating your new aquarium! The event of preparing a new aquarium and building its inner environment is a huge amount of fun for all keepers and enthusiasts. That said, some thought should be given to ensuring the set-up is appropriate for the specimens you plan to keep. Sure, it’s really important you like the decorative aspect of the aquarium, but it is equally important that it satisfies the needs of the fish species that will spend their life within it. Below are some essential tips to help you succeed at creating your dream aquascape with some long- term perspective for the fish you keep. Aquarium size and dimensions. While the popular catchall “Go big or go home” can apply to an aquarium purchase, a desktop or small aquarium is an option if the right type and size of fish are going to be kept. Make sure you understand the needs and behavior of the fish species that you prefer as your aquarium needs to be big enough to accommodate them. Pay particular attention to the behavior part as some smaller species due to their aggressive or territorial nature, may allow for only one male to be kept for example. When it comes to decorating the small aquarium, it is very easy to end up with a cluttered look. Try to create a central feature and complement it with your décor. Less is more here. When planning the actual set-up, make sure you follow this sequence to help you avoid some common pitfalls. First and most importantly, thoroughly rinse gravel, natural structural decoration and anything else you intend to put in the tank. Create your structural aquascape and then fill the tank approximately halfway, at that point you can plant your plants. Before you start the initial fill with water, remember to place a plate at the very bottom to evenly distribute the incoming water or otherwise dampen the force of incoming water to avoid upsetting your creative efforts. To read the rest of Fluval’s tips, click here.